Race against the clock as winter is coming soon. Many Kraljevo residents work to repair their homes even during the night, fearing heavy rainfall, while aftershocks (although weaker and weaker) are continuing to strike the greater Kraljevo area. The 5.6-magnitude quake hit the town early on November 3, killing two people and leaving thousands of homes either damaged or destroyed. A commission is currently working to determine which damaged structures have been rendered uninhabitable, but the number will ber likely approx. 1,000. Thus far, 13,000 buildings have been reported as unsafe, and the commission has appealed on skilled staff, including engineers, to join them in order to complete the job as soon as possible. Help is arriving to Kraljevo, but the town needs more volunteers and trucks to transport building material. Some of the families will likely have to be housed in prefab homes, said reports. Serbian interior minister Dacic declared that 310 structures (mostly houses) have been declared uninhabitable. B92, a Serbia news site wrote the following article (small excerpt below) – click here for the entire article. 1,130 structures have been inspected over the past few days, and specified that private homes account for 90 percent of the 4,000 structures damaged in the powerful earthquake. Experts from the CIP have been sent to Kraljevo to speed up the reconstruction process. Building material and 17 drinking water tank trucks have been sent to the area in order to normalize the situation as quickly as possible. The next stage in the relief effort is to restore houses and other residential structures asap. All Interior Ministry employees will give their one-day earnings to charity to help their colleagues in Kraljevo. EUR 920,000 in aid will be set aside from the Ministry’s emergency funds to repair the facilities damaged in the earthquake that hit Kraljevo early on Wednesday, killing two people and damaging around 4,000 structures. “The Kraljevo hospital will be restored first, followed by public infrastructure facilities such as schools, daycare centers, health care facilities etc,” Kalanović told reporters during a visit to the hospital. Dačić said that around 1,130 structures have been inspected over the past two days, and specified that private homes account for 90 percent of the 4,000 structures damaged in the powerful earthquake. The minister said that experts from the CIP traffic institute in Belgrade have been sent to Kraljevo to speed up the reconstruction process. He stated that members of the Interior Ministry’s Sector for Emergency Situations have been on the ground and helping the citizens from the moment the earthquake struck. Dačić commended the residents of Kraljevo saying there have been no incidents in the last two days that would require police intervention. According to him, building material and 17 drinking water tank trucks have been sent to the area in order to normalize the situation as quickly as possible. Dačić pointed out that the next stage in the relief effort is to restore houses and other residential structures as soon as possible. He reminded that the earthquake also damaged the homes of police officers, and said the Interior Ministry will help with the repairs. Dačić added that all Interior Ministry employees will give their one-day earnings to charity to help their colleagues in Kraljevo. Also today, Serbian Minister for the National Investment Plan (NIP) Verica Kalanović announced Friday that RSD 100mn (some EUR 920,000) in aid will be set aside from the Ministry’s emergency funds to repair the facilities damaged in the earthquake that hit Kraljevo early on Wednesday, killing two people and damaging around 4,000 structures. She announced that the project designers will be chosen as early as next week and that project documents should be completed by the end of the year, while the projects will be realized in 2011. Filed under: Aftershocks, Damaging earthquakes, Dangerous earthquakes, Deadly Quakes, Earthquakes with injured people, M +5 quakes, Minor earthquakes | Tagged: earthquakes, heavy earthquakes, Kraljevo, Kraljevo earthquake, Kraljevo Serbia, M 6 earthquakes, magnitude 6, photos earthquake Kraljevo, photos earthquake Serbia, pictures Kraljevo, powerful earthquakes, quakes, Serbia, Serbia earthquake, transform earthquakes, transform faults |	Comments Off on Kraljevo Serbia earthquake, 310 houses uninhabitable and 4,000 structures damaged! The local Serbian press has published pictures who say more than many words can tell. As a courtesy to the original publisher, we are showing hereunder thumbnails of these pictures with a direct link to B92 website. When clicking on the thumbnail, the original picture in the B92 website will be shown. 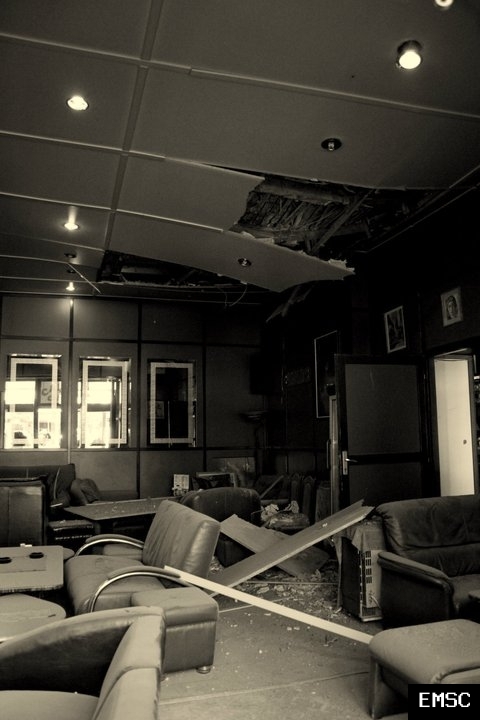 According to Tanjug’s correspondent, the damage caused by the earthquake is visible in the streets of Kraljevo – rubble, broken glass, cracked facades. 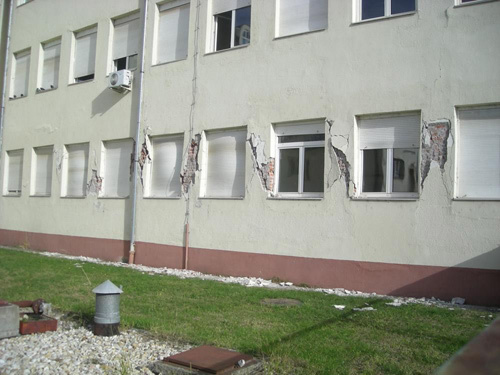 The hospital building in Kraljevo was also damaged by the earthquake, but no patients were injured. The operating block and polyclinic sustained the most damage. The town’s administration declared a state of emergency, with about a quarter of the urban area still without electricity. Landline telephony that was briefly out of service has also been restored. Authorities also announced that tap water was not safe to drink. The government will set aside some EUR 55,000 in short-term help for the town. 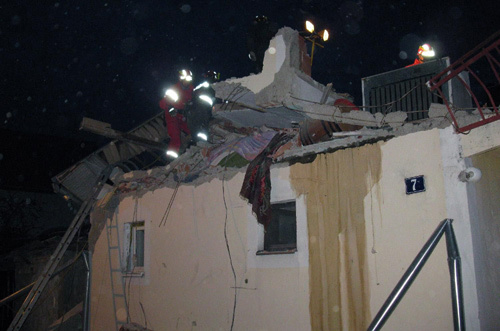 Two persons were killed and dozens were injured in an earthquake of 5.4 degrees Richter, which struck Kraljevo, a town in central Serbia, and places in its vicinity, at 1.56 a.m. The epicentre was 10km north of Kraljevo, in the village of Vitanovac. Serbian Interior Minister Ivica Dacic paid a visit to Kraljevo and confirmed that a married couple, Tanja and Sinisa Stosic, from Grdice in Kraljevo, were killed when a concrete plate fell on their house. Some 100 injured citizens have been admitted to the Emergency Unit. Many buildings have been damaged, including the hospital, but no patients were injured. The material damage is extensive. 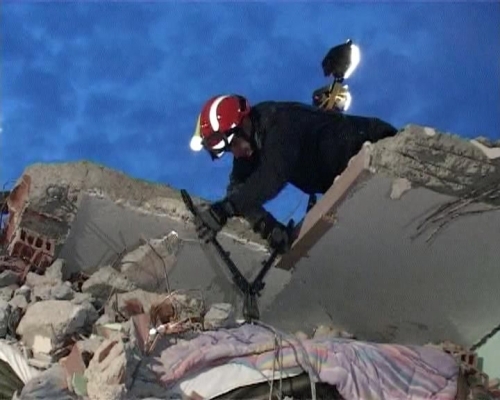 The places that have been hit most by the earthquake have been visited by the units of Gendarmerie and the Emergency Sector of the Serbian Interior Ministry. 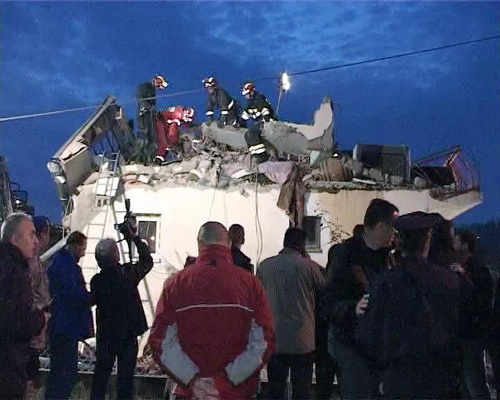 What appears as a moderate earthquake has made a lot of misery in Serbia’s Kraljevo, at least 2 people were reported killed, 15 injured and a lot of buildings has been damaged. We know out of experience and based on the kind of fault lines (mostly transform fault lines) that earthquakes of + M5 can create damage and injuries near cities. Additionally the hypocenter (focal depth) was very shallow at 10 km. 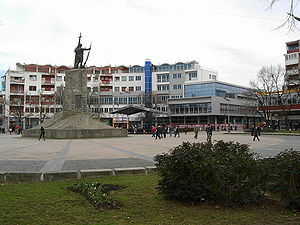 Kraljevo is an intermediate city in size, but with 65,142 inhabitants (2002 census, the greater city has today about 100,000 inhabitants) it can be very vulnerable for earthquakes. Water, electricity and other amenities are currently down. The earthquake was (of course) felt all over Serbia. Numerous (small) aftershocks have been experienced since the main shock. Because of the enormous number of refugees from Kosovo (around 18,500), the urban population of Kraljevo today is estimated to be close to 100,000. 2 km west from Kraljevo. Thanks to EMSC, the European Mediterranean Seismological Center, we have the possibility to show our readers how people experienced the earthquake with their own report writings. Eartquake-report.com is cooperating with EMSC for these testimonies and reports. Since 1 week we are linking the ‘experience’ form to evry earthquake we are publishing. We encourage people to fill them. The result of such report can be seen below. The location of these witness reports has been determined in part by the IP number of the reporting person. It was very frightening experience. Some parts of the city have been damaged severely, others less seriously. After this major earthquake, we felt more than dozen smaller ones, some strong enough to shake down bricks that were hanging from damaged buildings. Very strong earthquake. That was the strongest earthquake i felt for life. People are saying they first heard a sound, like a storm is coming, and then came the shaking, weak at first, and then strong with roaring and woodwork crunching. I was asleep, and woke up at strong shaking. Heard roaring and woodwork stretching. First i heard noice and it was like its comeing from outside the house,then glass things started making noice. And doors on my shelf opened. Pretty strange considering i barely felt the shaking(actually i don’t think i felt it at all),but there were loud noises and rumbling but intensity of the rumbling was low(e.g. as if someone was running compared to storm like sounds which occur during ‘normal’ earthquake). i am about 100km from epicenter and i felt very strong! i reed now online comments and watch tv, and we have first victims! 2 deads for now, around 50 ppl injured and many more to come. Swaying in the east-west direction seemed stronger than north-south. There was no up and down movement, seemed like more circular swaying. The earthquake itself seemed stronger than the reported 5.4. Everybody felt two in Belgrade, one less strong, pause for about 2 seconds, then the main one hit; most people seemed to wake up when the first one hit. Short (3sec), but a powerful earthquake was felt in Sarajevo BIH. First we heard the noise and strong pressure from the windows, and the bed rocked, and I literally fell out of it. Otherwise, I live on the 17th floor of a skyscraper. I was working a night shift on the second floor in a business building. All people were very scared when it hit us. It was very steady wave-like experience, usually it is shorter but this time it was at least 20-30seconds. Almost like it was not going to end! Everybody was starting to panic, but it faded out and it turned to nervous laughter. Kraljevo is a city and municipality in central Serbia, built beside the river Ibar, 7 km west of its confluence with the Zapadna Morava; and in the midst of an upland valley, between the Kotlenik Mountains, in the north, and the Stolovi Mountains, in the south. In 2002 the city (including its suburb area) had population of 65,142 (municipality: 121,707). It is the administrative center of the Raška District of Serbia. The city proper consists of 16 settlements. In 1991, Kraljevo-proper had 80,559 inhabitants. Because of the enormous number of refugees from Kosovo (around 18,500), the urban population of Kraljevo today is estimated to be close to 100,000. By far its most interesting feature is the Coronation church belonging to Žiča monastery. Here seven kings are said to have been crowned (seven crowns on coat of arms represents seven kings). The church is Byzantine in style, and has been partially restored; but the main tower dates from the year 1210, when it was founded by Saint Sava, the patron saint of Serbia. The famous monastery of Studenica, 39 km south by west of Kraljevo, stands high up among the south-western mountains, overlooking the Studenica, a tributary of the Ibar. It consists of a group of old-fashioned timber and plaster buildings, a tall belfry, and a diminutive church of white marble, founded in 1190 by King Stefan Nemanja, who himself turned monk and was canonized as Saint Simeon. The carvings round the north, south and west doors have been partially defaced by the Turks. The inner walls are decorated with Byzantine frescoes, among which only a painting of the Last Supper, and the portraits of five saints, remain un-restored. The dome and narthex are modern additions. Besides the silver shrine of Saint Simeon, many gold and silver ornaments, church vessels and old manuscripts, there are a set of vestments and a reliquary, believed by the monks to have been the property of Saint Sava who founded first hospital in Studenica in 13th century. NBA player Vlade Divac started his career in Kraljevo, while playing for “Sloga” basketball club (his wife is from Kraljevo). He now donates to the club. Another NBA player, Nenad Krstić was born in Kraljevo, and played for “Mašinac” basketball club from Kraljevo. 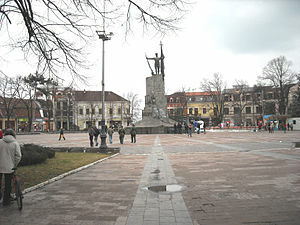 Kraljevo is the birthplace of international footballer Aleksandar Luković.